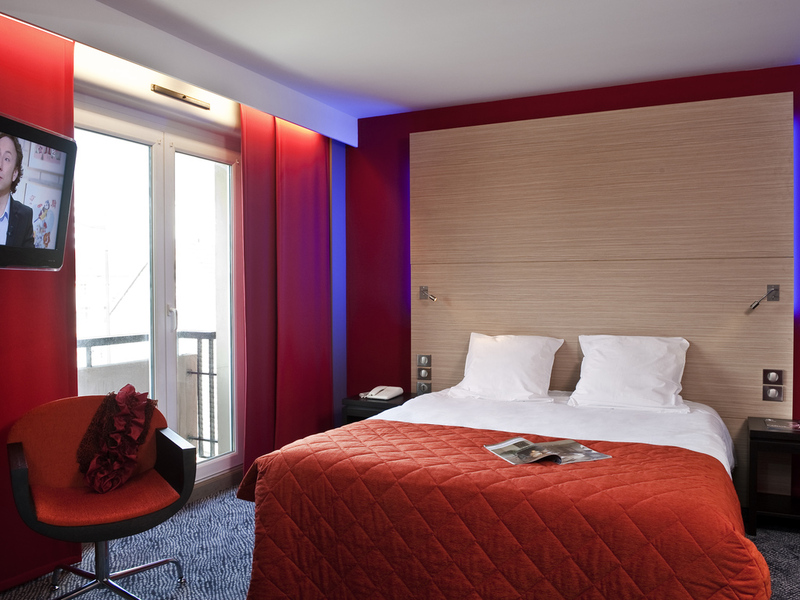 Breakfast and unlimited WIFI are included in all rates at the ibis Styles Saint Dizier. The 58 bedrooms, bar, conference rooms and restaurant at this 3-star hotel are all air-conditioned. Located in Saint Dizier town center, close to the stores and 5 minutes from Saint Dizier train station, the hotel is also close to Lake Der-Chantecoq. At the ibis Styles de Saint-Dizier you can organize your banquets and family reunions in our large lounges and Family Suites. Private garage for your bikes and motorcycles (for a fee). Cycle touring track nearby. French restaurant with traditional and local specialties. For aperitifs and refreshments, the hotel bar is open from 11.00 am to 11.00 pm. If you just need a light bit, try our range of sweet and savory snacks! We have stayed at your hotel on several occasions. We also eat in the restaurant and it would be more enjoyable if there was some restful music playing in the background. The restaurant always seems very quiet. Not the hotels fault but the noise from airforce jets was too much. Reception could have been more welcoming, we did not realise that the lift went down to the car park level. Room okay except for separate toilet. Bed very comfortable. Bar and dining area deserted so not welcoming. The noise from jets from nearby air base meant we could not relax and get to sleep easily. We really enjoyed the space, comfort and ambience of this hotel after a rather unsatisfactory experience in Bologna (not an Accor place). I would firstly like to compliment the manager who was on duty at my time of arrival in the evening. In particular his adaptability in providing me with two salads as my main at the time of my eating in the reasturant meal. I recognise that he has to be accountable for the management of the hotel reasturant and as such must comply with the price of the menu and hence the 12 euro charge. However it is a pity that there are not more vegetarian options avaialble on the Accor groups menu's. Relative to the rooms the design of the window blinds are rather poor designfull as they inhibit the window from remaining open. I would be happy to return to the hotel. We always like to stop in St. Dizier on our way through to the Vosges. The Ibis Styles is also close to the Lac du Der, which is a popular stopping off place. The hotel always makes us feel welcome and the breakfast sets us up for the next day. I was, just very surprise, that, there weren't any Christmas decoration, No Christmas Tree inside the hotel lobby or the breakfast Romm and no illimunation!! Quelle déception pour un 24 / 25th of December. The staff was friendly and efficient. Parking was adequate. The room was clean and the bed was comfortable. There was an unpleasant smell in the bathroom (sulfur in the water? ), and the balcony had not been cleaned in months/years. Dirty floor and mold on the railing. We have stayed in many Ibis Styles in Europe, and especially look forward to breakfast. This was the worst I had ever experienced at an Ibis Styles. The only good part was the orange juice, which used real oranges. The bread was very industrial (there must be good bakeries in St. Dizier), with only one type of jam. The cereal choices were unhealthy--only corn flakes and some kind of sugar pops. No muesli. Fruit was sorry-looking. No eggs, no hot dishes. In general, a disappointment. Nice welcome, very good breakfast, very spacious room, lovely bathroom. Very welcoming, as usual with minimum fuss and nice comfortable bed. Clean, comfortable, good breakfast. What more can one ask for? The rooms at the new IBIS Styles Saint Dizier are larger than usual at IBIS Styles and they are very nicely decorated, impeccably clean and functional. Breakfast is good. The staff are very friendly. The neighbourhood is average, but the hotel is close enough to the center and not too far from the SNCF station. would have been better with better staffing levels especial when my wife had a fall on the front steps causing injury to both her legs. Short stay but very enjoyable! Room was good and breakfast also fine. However, we arrived late (as notified beforehand) and we were firstly given a double room rather than family room as booked. We had to come back to reception and move our luggage to be given a key to a family room. The key didn't work. We then went back to reception where the guy on duty couldn't get the key to work so just opened the room with a master key and said next morning we would have to get reception to reopen the room for us after breakfast. He wasn't apologetic at all and actually seemed to find it quite funny. Given it was half past midnight by this point, we didn't. So 9 out of 10 for the room and 3 out of 10 for the service! Apart from the lift not working, the restaurant being closed and the toilet in our room not flushing, our stay was very comfortable. The &quot;limited menu&quot; that was available in the restaurant was very good and the staff very friendly and helpful. Advance notice of the restaurant closure would have been appreciated. Also, the car park was very icy and slippery and should have been gritted/salted.